Touring behind their third CD, the recently released Mine is Yours, indie pop-rockers Cold War Kids perform at Bates College at 9 p.m. Friday, April 29, in the Clifton Daggett Gray Athletic Building (“Gray Cage”), 130 Central Ave.
Portland-based singer-songwriter Lady Lamb the Beekeeper opens. Tickets are $20 and available at www.batestickets.com. The concert is sponsored by the college’s student-run radio station, WRBC-FM. For more information, please contact erowley@bates.edu. 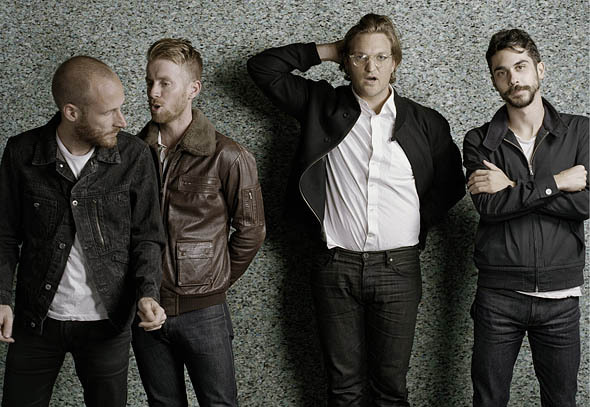 Since their modest beginnings as four guys driving around southern California with their gear in their cars, practicing wherever they could steal a space, Cold War Kids have always exhibited two qualities in their music: intense passion and emotional truth. For Mine Is Yours, the Kids recorded for the first time with an outside producer, Jacquire King, whose clients have included Tom Waits, Kings of Leon, Norah Jones and Modest Mouse. From Long Beach, Calif., the Cold War Kids are Nathan Willett on vocals, piano and guitar; Jonnie Russell on guitar, vocals and keyboard; Matt Maust on bass and guitar; and Matt Aveiro on drums and percussion. Both on Downtown, the quartet’s first two albums, Robbers & Cowards (2006) and Loyalty to Loyalty (2008), emerged like miniature gothic novels as Willett channeled taut dramas of men on the edge, families in peril and crises of faith. The new album deals with the push and pull of human relationships, the glue that holds them together and the equilibrium they sometimes find. “Mine Is Yours” finds the foursome at their most sonically potent, and Willett at his most revealing and vulnerable.